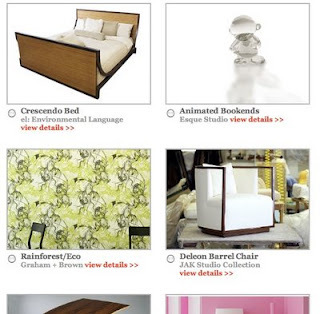 In case all of you who are designers did not know- Interior Design is holding their BEST OF YEAR 2008 awards right now. You can visit their site and vote for your favorites in a multitude of categories and projects. Everything from the new walk stations- where you walk the treadmill while working - to the stackable candelabra from Vicente Wolf. Speaking of fantastic new products- included in the ECO PRODUCTS is the Deleon Barrel Chair from my collection - JAK Studio Collection with Ms. Kelly LaPlante. Its sophisticated and sustainable and certainly not what you would think of when you think "green" furniture. But yes- you can have fantastic style and still be sustainable.